Chicago, ILLINOIS, is indisputably one of the world’s great cities. It is a focal point for business, technology, art, food, architecture, and sports. There is never an excuse for boredom in this international city. Whether you’re on the beaches of Lake Michigan or walking down the upscale shopping district of Michigan Avenue, Chicago never disappoints. accredited learning and research community, with its Main Campus in a safe, residential neighborhood on the Northwest Side of Chicago plus three other locations in the area. represented by our student body. Pre-arrival support, airport pick-up, comprehensive orientation, ongoing support and assistance, maintaining visa compliance with Optional Practical Training (OPT) after graduation. The Intensive English Program (SAELL) holistically develops the English proficiency of international students. It is open to undergraduate and graduate students, and it can provide a way to obtain conditional admission. The TOEFL exam is administered in the course. Learn more at neiu.edu/saell. • Campus housing costs start at $8,760 per year. Northeastern’s new residence hall, The Nest, is located in the heart of the Main Campus. The apartment-style units come fully furnished with full-sized kitchens and utilities included. Amenities include on-site tutoring, exercise facilities, modern security and more. FINANCIAL AID: International students are eligible for most grants and scholarships awarded by the NEIU Foundation. Graduate students are also eligible for graduate assistantships, which cover tuition plus a stipend. * These deadlines do not apply to the graduate Counseling and Social Work programs. You’re going to college and the possibilities are endless. What will your major be? Which clubs will you join? Only you can decide, but we can help you make some of the most important decisions about your future. Why should you choose Northeastern Illinois University? 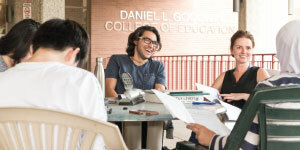 As one of the most diverse universities in the nation, we provide ourstudents an affordable quality education with more than 40 undergraduate degree and certificate programs and more than 50 graduate degree, certificate, licensure, and endorsement programs in the arts, sciences, education, and business. In its latest “America’s Best Colleges” publication, U.S. News & World Report ranked Northeastern as the most ethnically diverse Midwest public regional university. Northeastern has been on the list since 1997, the first year U.S. News & World Report established the category. Northeastern’s 67-acre Main Campus on the Northwest Side of Chicago is a welcoming community to the more than 8,000 students who attend Northeastern. In addition to our Main Campus in the North Park neighborhood of Chicago, we also have locations in the Avondale and Bronzeville neighborhoods and in Grayslake, Illinois. Students can take advantage of our residence hall’s convenient location and unmatched amenities. The Nest is located centrally on the Main Campus and includes features such as a fitness center, computer center, recreation lounge, billiards, foosball, air hockey, and much more. Once you get started at Northeastern, our faculty will prepare you to think critically, adapt to change, solve problems, and become a leader in your chosen field—qualities employers look for. Along your academic journey, internships and research opportunities are excellent avenues for exploring and gaining practical experience; they look great on résumés and give you a distinct advantage in any job search. We support student research through symposia, independent studies, and research positions. Northeastern offers several academic support programs, including the University Honors Program, which gives students an edge when entering the professional world or graduate school. Northeastern also offers tutoring, consulting, disability services, international study tours and alternative spring breaks. Northeastern offers student leadership and civic and community engagement opportunities. In addition to a lively arts community, there are more than 100 student organizations, including Greek life and cultural and major-specific clubs for students in the arts, sciences, business, and education. And if you want to break a sweat? Northeastern has more than 25 team and club sports, fitness classes, and outdoor adventures. On the days you want to mix it up, spend a morning downtown shopping or visiting museums, then spend an afternoon studying while stretched out in the University Commons. Northeastern offers students the best of both worlds—access to all Chicago has to offer and a retreat from its hustle and bustle. Northeastern’s Main Campus is located in a safe community filled with residential homes on tree-lined streets. The diversity of Chicago is reflected in the shops and restaurants that are all just walking distance from the University. International students are never far from the food and other items they are used to from home. International students are allowed to work on campus part time for up to 20 hours per week under the provisions of the F-1 visa. Graduate assistance is offered through the College of Graduate Studies and Research. Some programs offer curricular practical training for international students for part-time work. Optional Practical Training (OPT) is available after your degree is completed. At Northeastern, you’ll make friends from all walks of life, but your experience isn’t limited to your time on campus. Take advantage of the University’s connections to explore all Chicago’s cultural and professional opportunities. 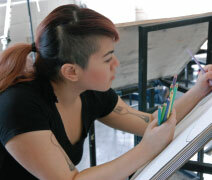 Now that you’ve taken a closer look at our University, find out about our admission process at neiu.edu/admissions.